Water quality in fish ponds is affected by the interactions of several chemical components. Carbon dioxide, pH, alkalinity and hardness are interrelated and can have profound effects on pond productivity, the level of stress and fish health, oxygen availability and the toxicity of ammonia as well as that of certain metals. Most features of water quality are not constant. Carbon dioxide and pH concentrations fluctuate or cycle daily. Alkalinity and hardness are relatively stable but can change over time, usually weeks to months, depending on the pH or mineral content of watershed and bottom soils. or rises above 10 (e.g., low alkalinity combined with intense photosynthesis by dense algal blooms – phytoplankton or filamentous algae). dioxide (CO2) concentrations can become high as a result of respiration. The free CO2 released during respiration reacts with water, producing carbonic acid (H2CO3), and pH is lowered. pH and limit the capacity of fish blood to carry oxygen by lowering blood pH at the gills. At a given dissolved oxygen concentration (e.g., 2 mg/L, milligrams per liter; same as parts per million, ppm), fish may suffocate when CO2levels are high and appear unaffected when CO2 is low. Catfish can tolerate 20 to 30 mg/L CO2 if accumulation is slow and dissolved oxygen concentrations are above 5 mg/L. In a reservoir or natural pond, CO2 rarely exceeds 5 to 10 mg/ L.
High CO2 concentrations are almost always accompanied by low dissolved oxygen concentrations (high respiration); the aeration used to increase low dissolved oxygen will, to some extent, help reduce excess CO2 by improving its diffusion back into the atmosphere. Chronically high CO2levels can be treated chemically with hydrated lime, Ca(OH) 2. Approximately 1 mg/L of hydrated lime will remove 1 mg/L of CO2. This treatment should not be used in waters with poor buffering capacity (low alkalinity) because pH could rise to levels lethal to fish. Also, fish could be endangered if hydrated lime is added to waters with high ammonia concentrations. High pH increases the toxicity of ammonia. The quantity of base present in water defines what is known as total alkalinity. Common bases found in fish ponds include carbonates, bicarbonates, hydroxides, phosphates and berates. Carbonates and bicarbonates are the most common and most important components of alkalinity. Alkalinity is measured by the amount of acid (hydrogen ion) water can absorb (buffer) before achieving a designated pH. Total alkalinity is expressed as milligrams per liter or parts per million calcium carbonate (mg/L or ppm CaCO3). A total alkalinity of 20 mg/L or more is necessary for good pond productivity. A desirable range of total alkalinity for fish culture is between 75 and 200 mg/L CaCO 3. The resultant water has increased alkalinity, pH and hardness. In water with moderate to high alkalinity (good buffering capacity) and similar hardness levels, pH is neutral or slightly basic (7.0 to 8.3) and does not fluctuate widely. Higher amounts of CO2(i.e., carbonic acid) or other acids are required to lower pH because there is more base available to neutralize or buffer the acid. The relation ship among alkalinity, pH and CO2 can be determined from Table 2. 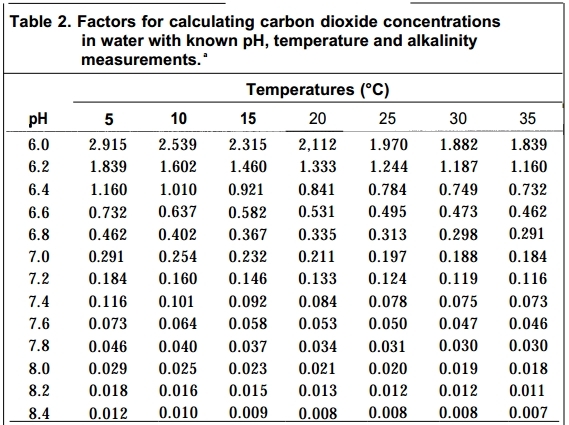 The number (factor) found in the table which corresponds to the measured pH and water temperature is multiplied by the measured alkalinity value (mg/L as CaCO3). The product of these numbers estimates CO2 concentration (mg/L). The bases associated with alkalinity react with and neutralize acids. Carbonates and bicarbonates can react with both acids and bases and buffer (minimize) pH changes. The pH of well buffered water normally fluctuates between 6.5 and 9. In waters with low alkalinity, pH can reach dangerously low (CO2and carbonic acid from high respiration) or dangerously high (rapid photosynthesis) levels. Phytoplankton are microscopic or near microscopic, aquatic plants which are responsible for most of the oxygen (photosynthesis) and primary productivity in ponds. By stabilizing pH at or above 6.5, alkalinity improves phytoplankton productivity (pond fertility) by increasing nutrient availability (soluble phosphate concentrations). Alkalinities at or above 20 mg/L trap CO2 and increase the concentrations available for photosynthesis. hardness. If calcium, magnesium and photosynthetically produced carbonate are present when pH is greater than 8.3, limestone is formed. Ponds with alkalinities below 20 mg/L do not usually support good phytoplankton blooms and do not commonly experience dramatic pH increases because of intense photosynthesis. Water hardness is important to fish culture and is a commonly reported aspect of water quality. It is a measure of the quantity of divalent ions (for this discussion, salts with two positive charges) such as calcium, magnesium and/or iron in water. Hardness can be a mixture of divalent salts; however, calcium and magnesium are the most common sources of water hardness. Hardness is traditionally measured by chemical titration. The hardness of a water sample is reported in milligrams per liter as calcium carbonate (mg/L CaCO 3). Calcium carbonate hardness is a general term that indicates the total quantity of divalent salts present and does not specifically identify whether calcium, magnesium and/or some other divalent salt is causing water hardness. Hardness is commonly confused with alkalinity (the total concentration of base). The confusion relates to the term used to report both measures, mg/L CaCO3. If limestone is responsible for both hardness and alkalinity, the concentrations will be similar if not identical. However, where sodium bicarbonate (NaHCO3) is responsible for alkalinity it is possible to have low hardness and high alkalinity. 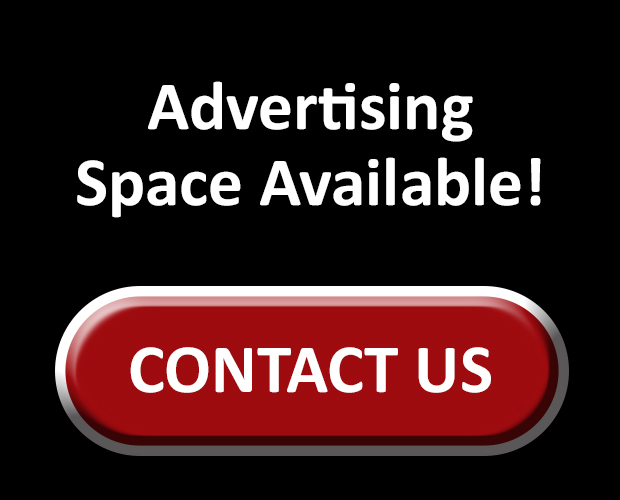 Acidic, ground or well water can have low or high hardness and has little or no alkalinity. Calcium and magnesium are essential in the biological processes of fish (bone and scale formation, blood clotting and other metabolic reactions). Fish can absorb calcium and magnesium directly from the water or from food. However, calcium is the most important environmental, divalent salt in fish culture water. The presence of free (ionic), calcium in culture water helps reduce the loss of other salts (e.g., sodium and potassium) from fish body fluids (i.e., blood). Sodium and potassium are the most important salts in fish blood and are critical for normal heart, nerve and muscle function. Research has shown that environmental calcium is also required to re-absorb these lost salts. In low calcium water, fish can lose (leak) substantial quantities of sodium and potassium into the water. Body energy is used to re-absorb the lost salts. For some species (e.g., red drum and striped bass), relatively high concentrations of calcium hardness are required for survival. A recommended range for free calcium in culture waters is 25 to 100 mg/L (63 to 250 mg/L CaCO3 hardness). Channel catfish can tolerate low calcium concentrations as long as their feed contains a minimum level of mineral calcium but may grow slowly under these conditions. Similarly, rainbow trout can tolerate waters with free calcium concentrations as low as 10 mg/L if pH is above 6.5. If freshwater culture of striped bass, red drum or crawfish is being considered, free calcium concentrations in the 40 to 100 mg/L range (100 to 250 mg/L as CaCO3hardness) are desirable; a value of 100 mg/L (250 mg/ L calcium hardness) matches the calcium concentration of fish blood. Tests specific for calcium hardness should be performed on samples of the water source being considered for these animals. be reasonably safe to assume that high hardness measurements reflect high calcium levels. CaCO3 value by 4.12) if hardness is caused by magnesium only. These factors (2.5 and 4.12) are related to the molecular weight of CaCO3 and the difference in weights between calcium and magnesium atoms. Where hardness is caused by limestone, the CaCO3 value usually reflects a mixture of free calcium and magnesium with calcium being the predominant divalent salt. Agricultural limestone can be used to increase calcium concentrations (and carbonate-bicarbonate alkalinity) in areas with acid waters or soils. However, at a pH of 8.3 or greater, agricultural limestone will not dissolve. Agricultural gypsum (calcium sulfate) or food grade calcium chloride could be used to raise calcium levels in soft, alkaline waters. Expense might be prohibitive if large volumes of water need treatment. Identifying a suitable water source may be more practical. Ammonia becomes more toxic as pH increases. Higher concentrations of the toxic form of ammonia (NH3) are formed in basic waters; while the less toxic form, ammonium (NH4+), is more prevalent in acidic waters. Since alkalinity increases pH, ammonia will be more toxic in waters with high total alkalinity. Hardness is not typically associated with ammonia toxicity. Metals such as copper and zinc are commonly used around aquatic environments (tanks, plumbing and copper sulfate). These metals become more soluble in acidic environments. The soluble or free ionic forms of these metals are toxic to fish. High total alkalinity increases pH and available bases which produce less toxic or insoluble forms of copper and zinc. High concentrations of calcium and magnesium (hardness) block the effects of copper and zinc at their sites of toxic action. Therefore, copper and zinc are more toxic to fish in soft, acidic waters with low total alkalinity. 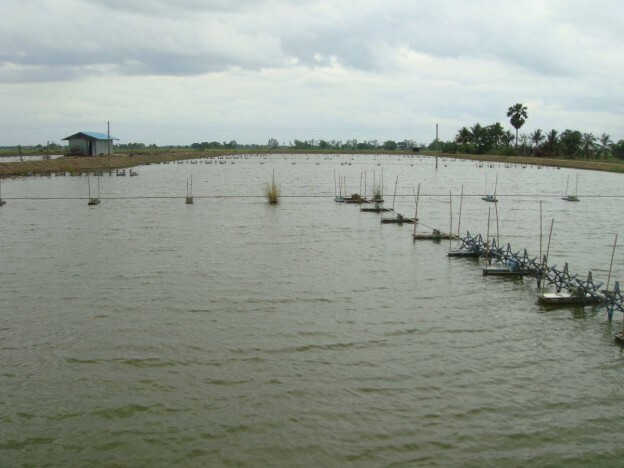 Ideally, an aquaculture pond should have a pH between 6.5 and 9 as well as moderate to high total alkalinity (75 to 200, but not less than 20 mg/L) and a calcium hardness of 100 to 250 mg/L CaCO3. Many of the principles of chemistry are abstract (e.g., carbonate-bicarbonate buffering) and difficult to grasp. However, a fundamental understanding of the concepts and chemistry underlying the interactions of pH, CO2, alkalinity and hardness is necessary for effective and profitable pond management. There is no way to avoid it; water quality is water chemistry. You have posted a great story here and i hope it will useful for other readers.kindly update more ideas.